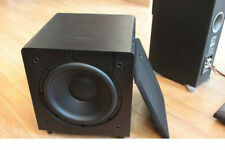 UP FOR SALE IS SUNFIRE SDS10 POWERED SUBWOOFER. S/N: SDS10 A13-13520565. Sunfire SDS10. 10" FRONT FIRING WOOFER WORKS AND LOOKS GREAT. 10" DOWN FIRING RADIATOR WORKS AND LOOKS GREAT, AS WELL. The SDS-10 incorporates Sunfire's wide-band, energy efficient Class D amplifier and produces twice the output of its smaller sibling - while only consuming a half a watt in standby. Trending at $236.66eBay determines this price through a machine learned model of the product's sale prices within the last 90 days. The SDS-8 is the perfect choice for systems where small size and high output are equally important. A front firing, 8" custom Sunfire driver is acoustically matched to an 8" down-firing passive radiator, creating nearly double the output compared to conventional single-driver designs. 2x Crestron EXCITE IC6-W-T In-Ceiling Speakers 6.5" 75W. Brand New In Box. Nothing more and nothing less. Woofer 12". Custom, High Excursion Woofer. Actual Images of item are shown above. For sale I have a new open box Sunfire SDS12. Pictures are of actual item you will receive. 12" poly-coated fiber cone woofer. Black ash vinyl finish. Down-firing 12" passive radiator. Gold-plated line-level inputs and outputs. Tweeter: 6" Cineman Ribbon. Woofer: Four 4.5". Enclosure Type: Sealed. Other Specifications. UPC 844039007117. Warranty Policy. 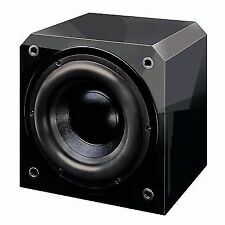 SUNFIRE SDS-8 8" 200 Watt Dual Driver Powered Subwoofer NEW SDS8 Fast shipping. Sunfire SDS8. Sunfire SDS8 Specifications. Sunfire SDS8 Features at a Glance. Woofer: 8". The SDS-8 is the perfect choice for systems where small size and high output are equally important. A front firing, 8" custom Sunfire driver is acoustically matched to an 8" down-firing passive radiator, creating nearly double the output compared to conventional single-driver designs. 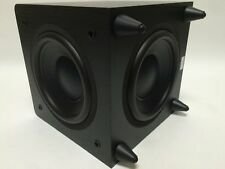 5 out of 5 stars - SUNFIRE SDS-8 8" 200 Watt Dual Driver Powered Subwoofer NEW SDS8 Fast shipping. 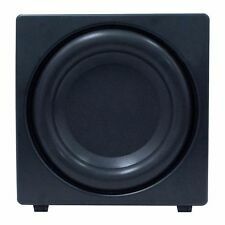 2 product ratings2 product ratings - SUNFIRE SDS-8 8" 200 Watt Dual Driver Powered Subwoofer NEW SDS8 Fast shipping. Driver Impedance 4 ohms. Maximum SPL (inc. room gain) 103 db. Frequency Response 30-150Hz. NO EXCEPTIONS. Sunfire HRS-SAT4C Center Channel Speaker High Definition Great preowned condition. The white dots that you see on the case are a reflection from the ceiling lights. The long side with the scratches, is the bottom of the unit, Notated by the three feet. In my other auctions you will also find the matching surround speakers and the matching powered subwoofer! Please check out our other auctions for other great designer clothing, shoes, handbags and accessories. Please follow our eBay store to receive automatic notification of all of our new listings as they hit the market. It has a White paintable grille ! Unlike other in wall speakers, these dont use the inner wall as a baffle, these have thier own self- contained enclosure for the baffle. What you get is precise sound, and accurate midbass. Works great ! 440 watts per channel. That best describes the new Sunfire In Wall 8 Subwoofer System. Sunfire Audiophile HRS-8 Powered Subwoofer, Working. 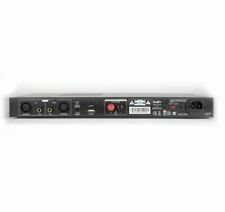 Sunfire SDSWIRX Wireless Subwoofer Receiver and SDSWITX Subwoofer Transmitter. Shipped with UPS Ground. Sunfire CRM2 Ribbons / B-Stock / 1 Pair huge savings! AUTHORIZED DEALER ! These are Rosewood in color, they look gloss black from a distance ! In otherwords its not worth the gamble ! You can go to Sunfires website , and read the ( Warning ! ). Be sure not to miss out on this opportunity. Imagine a 2700 watt subwoofer so thin in form and free of vibration that it can be safely mounted on your wall. A subwoofer whose technical lineage dates back to landmark products developed more than a decade ago. New in Box, Hasn't been opened. Sunfire CRS-3 (left & right). Sunfire CRS-3C (center). Speakers and grills are in great condition. No scratches, blemishes, holes, or problems. Work great! The wall mount brackets have small areas of paint overspray where they were installed. In otherwords its not worth the gamble ! You can go to Sunfires website, and read the ( Warning ! ). Be sure not to miss out on this opportunity. If you have never experienced a Sunfire product, you dont know what you are missing ! This is a factory sealed Sunfire SDS12 DUAL 12 " Subwoofer, with a 600 WATTS OF PEAK POWER ! In otherwords its not worth the gamble ! You can go to Sunfires website , and read the ( Warning ! ). Tweeter: 6" Cineman Ribbon. Woofer: Four 4.5". 25 to 440 Watts RMS. Excellent Condition - Sunfire Center Speaker is unused and works great - no issues, no wear from. We take pride in serving you! Check out our huge selection of diverse products. Pair Sunfire CRS-3 Cinema Ribbon Trio LCR Speakers (Rosewood) Incl. Mounts!